Not known for doing things in small measures (with the exception of sample bottles) First Olympian are at it again. Succeeding Loki and Baldr comes the newest member of the Valhalla range, ODIN. First Olympian have really done their homework and then some with this oil. Taking it's inspiration from the Allfather, the blend is warm, rich, mysterious and alluring. Based around the calming notes of chamomile and the bright, divine elements of begonia, you will find this oil to be complex and manly in equal measure. After all he's a war-God but also a poetry-God who is whorshipped by those in search of prestige, honor and nobility. 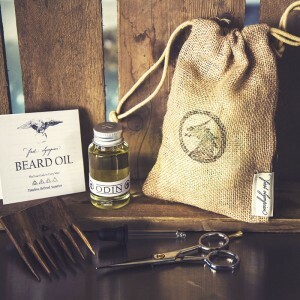 The nutritious base of grape seed and organic Argan make this oil light, yet deeply enriching for your beard. The perfect accompaniment to the encroaching winter months, the warming and comforting quality of this oil will bring a sense of calm and focus to your labours while keeping your beard in beautiful condition. I've been wearing ODIN for just over a week now and can't get enough of it. With shamanic-like qualities from the moment you put it on, this oil perfectly embodies the mythology. Wearing it is akin to having Odin's blessings lavished upon you. For anyone not convinved by my words alone you can buy a sample bottle. And if that fails to convince you then you will not be deemed worthy and the bezerkers will surely be set upon you! For those of you already familiar with the First Olympian range and exemplary service, you'll be pleased to know that ODIN is also available as part of the Valhalla Gift Set. Best of all you don't have to travel to Asgard via the Bifrost you can get yours online HERE. And I leave you with this apt line from Led Zeppelin's Immigrant Song, "Valhalla I am coming."